I hope that the voices of the retired Bishops Hollis, Crowley and McMahon are not crying in the wilderness with their support for allowing married men to be ordained. The sacramental deficits which are inevitable as the number of active priests continues to fall could perhaps be addressed by a more imaginative approach to ordained ministry. 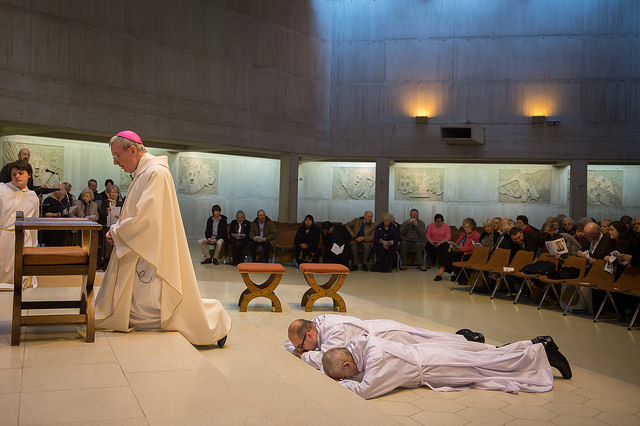 Some people have suggested conferring priestly holy orders on married permanent deacons. This might solve some of the problems, since a number of permanent deacons originally tested vocations to the priesthood but found they did not have the “gift of celibacy”. My own research in this field in Southwark Province, undertaken in 2007/8, indicates that of 53 respondents, almost 27 per cent had originally felt called to the priesthood and an additional 9 per cent (5 respondents) had felt called to other ministry – two in Anglican Orders before becoming Roman Catholics, and three in non-priestly ministry. A more extensive survey undertaken with permanent deacons from England, Wales and Scotland by researchers from Ushaw College in 2006, indicated that more than half of their 229 respondents had considered a priestly vocation before the age of 18, 7.4 per cent had attended junior seminary and 13.9 per cent had attended a senior seminary or entered a religious order. So, in effect, had it not been for the requirement of celibacy many of these contemporary deacons may well have found themselves in priestly ministry. However, a further dilemma is captured in the words of the ordination ceremony for permanent deacons. Those who are unmarried at the time of ordination, including widowers, must vow themselves to celibacy thereafter. In the words of the presiding bishop: “By this consecration you will adhere more easily to Christ with an undivided heart.” The subtext of this might be read as a suggestion that the married men about to be similarly ordained do have divided hearts. That their family life and marriage are perhaps regarded as somehow second-best. There is of course the possibility, that, on the decease of his wife, the deacon might consider a vocation to the priesthood but I would hope that bishops would show the utmost compassion and sensitivity in making such an approach to a deacon in mourning. Those who are called to married life and are inspirational and ethical professionals in the commercial world may not be the best candidates for life as presbyters. Deacons bring witness and ministry into the workplace and the public square in a way that priests and bishops cannot. Deacons are the only rank of ordained clergy permitted to have secular professional and civic roles. So, in effect, rather than trying to squeeze deacons into a traditional presbyteral mould that may not suit their gifts, a deeper appraisal of Holy Orders is called for. Now seems an opportune time to undertake such an exercise, acknowledging the presence of God in marriage, family life, celibacy, the workplace, civic life – in fact, we need to re-evaluate how best to be Christ to the world. Is Celibacy A Higher Calling than Marriage? Budgie: Matrimony is a sacrament in the eyes of this church. Celibacy is not. Are you saying that a non-sacrament is a higher state than a sacrament? My concern is that the permanent diaconate has become massively clericalised. My first encounter with a permanent deacon was living as a teacher in my first real London parish, Southall, in 1972. The deacon, Michael Jennings, worked on the shop floor in a local company. I got to know. Michael fairly well as I taught his children. At the same time I was undertaking a Unviersity funded study of Southall parish. Michael's role was not a traditionally clerical role. He organised the Catholic life of his remoter section of the parish with its own Mass centre. Michael certainly did not wear a clerical collar. He was not a glorified altar server! In fact he only appeared on the sanctuary when he made announcements. A few years later in my role as Chairman of Westminster Adult Education Committee I encounter another deacon, David. Myles-Board, from the Catholic Media Office. He was very different from Micahel in terms of educational attainment and yet he remained a non-clericalised deacon. Then a few years after Cardinal Hume's arrival in Westminster there was a decline in the diaconate...we were told that the cardinal did not want a new clerical class and that he felt it further emphasized the male power supremacy of our church. Here in Lourdes with Westminster, I reflect on my more recent experience of diaconate in which deacons undertake the readings and bidding prayers, which were formally lay ministries. It is all very interesting, especially the celibacy!!! Martin is wrong on the question of authority. What is being suggested is that our bishops should examine the question, not that they should make a unilateral decision. Pope Francis is quoted as saying that "regional and national bishops’ conferences should seek and find consensus on reform and .. should then bring up ... suggestions for reform in Rome." What is that if not a clear papal licence and invitation to address the issue of married priests? There is no such thing as the permanent diaconate. It is not a holy order. There are, however, deacons who exercise that order permanently. The three holy orders of bishop, priest and deacon remain unchanged. The Church teaches clearly that, politically incorrect though it may be, the celibate state is superior to the married one. Sorry about that but it's true and was underlined and reiterated by St JPII. To see the wisdom of it requires no explanation. "Francis has already invited bishops to seek and propose courageously pastoral solutions to address the problem of a shortage of vocations in countries such as Brazil." And yet Martin, after Francis met with +Erwin Krautler and discussed the serious lack of priests in his Brazilian Diocese, he advised him to come up with a solution and present it to Rome, not to wait for the initiative to come the other way. The Brazilian Bishops' Conference have done just that and set up a Commission to examine options. Our bishops are not 'goto' bodies acting without their own authority. Let's hope they have the courage to begin a courageous conversation. "Now a recent conversation between the pope and a bishop from Brazil about the priest shortage may be moving the issue of married clergy onto the pontiff's agenda. During the meeting, Krautler and Francis compared notes on how much the priest shortage affects the church, especially in the Southern Hemisphere. Krautler's diocese, geographically the largest in Brazil, has just 27 priests for 700,000 Catholics, most of whom might attend Mass a couple of times a year. Francis said he knew of a diocese in Mexico where parishes had a deacon but no priest, and the pope wondered how things could go on that way -- which is when Krautler raised the idea of married priests. "The pope explained that he could not take everything in hand personally from Rome. We local bishops, who are best acquainted with the needs of our faithful, should be 'corajudos,' that is 'courageous' in Spanish, and make concrete suggestions," the bishop told an Austrian newspaper the next day." So how do they make suggestions - firstly by examining the issue! "However our Conference shows no sign of examining this issue, why?" Because they don't have the authority. To me the major question is when will the Bishops' Conference of England and Wales look at the issue of ordaining married men to the priesthood? I am a married deacon and I do not believe that I have a calling to the priesthood. The Ministry of the Permanent Diaconate is quite separate to a Priestly Ministry. There cannot be any theological problem with married clergy as they exist within the Latin Rite of the Catholic Church. Yes there will be practical and financial issues to resolve, but they can be dealt with on a case by case basis. However our Conference shows no sign of examining this issue, why?